By the time you read this, I’ll be the ripe old age of 25. It’s a little bit terrifying to say that, mainly because when I was younger I always assumed 25-year-olds had got their lives together. And also, because I still think it’s like 2006. Seriously, where did the last 10 years go?! But it’s not all doom and gloom. The last 25 years have been pretty amazing in many ways. I’ve met some wonderful people, travelled to some incredible places, and worked hard to get myself a proper career that I’m (semi) proud of. I’ve overcome an anxiety disorder, given a new home to 6 cats and watched basically every single movie and TV show on Netflix. I’m proud of each and every one of these achievements in different ways. But it’s my travel experiences that have provided me with some of the most lasting memories. Of course, my travels have well and truly progressed from the caravan holidays in Norfolk I used to go on with my mum and grandparents. But that doesn’t mean that my trips when I was younger were any less important in shaping the person I am today. 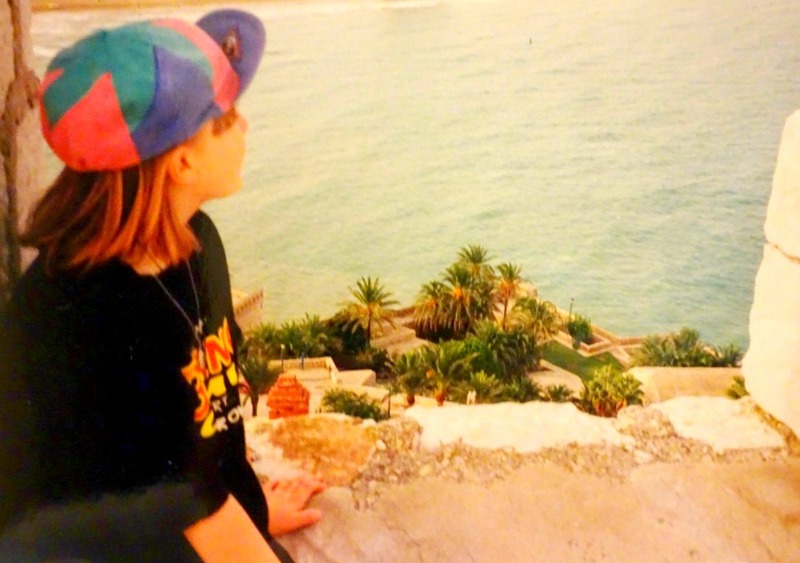 So, to celebrate my big 2-5, I’ve put together a list of my 25 most memorable travel experiences from the last quarter-century (including some pretty embarrassing pictures of me rocking the 90s fashion…). 1. Staying at Mundesley Caravan Park — making a friend and decided we wanted everyone to think we were really exotic and fluent in another language. So we just went around talking literal gobbledigook. 2. Snuggling up in a rented beach hut at Walton on the Naze with my mum, nan and grandad. Technically I don’t actually remember this moment because I was basically born the day before. But it was taken at Walton on the Naze, the place of many happy family holidays! 4. Family holidays in Scarborough. Most notably when we went to Terror Towers and I got so freaked out I cried the entire time and ran out. 5. Going up the Eiffel Tower with my nan, while my mum went on a Paris boat trip because she was scared of heights. 7. My first trip to Alcossebre, Spain. 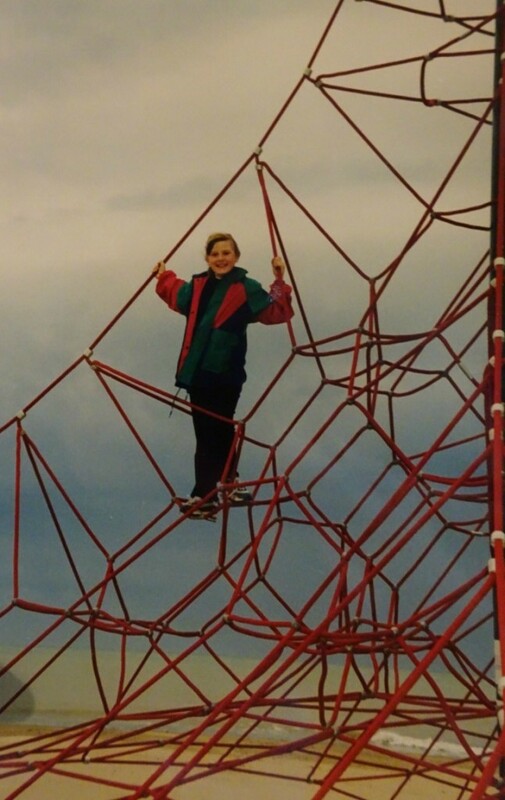 Finding this red spider climbing frame was pretty much the highlight of my entire trip. And look how proud I was at getting two metres off the ground! 8. Another Scarborough memory, when my mum and I would go to Peasholm Park and hire out pedal boats in the shape of swans. 9. Visiting my nan’s friends in Lourdes, and being told to watch out because there were snakes in the garden. Still emotionally traumatised 15 years on. 10. 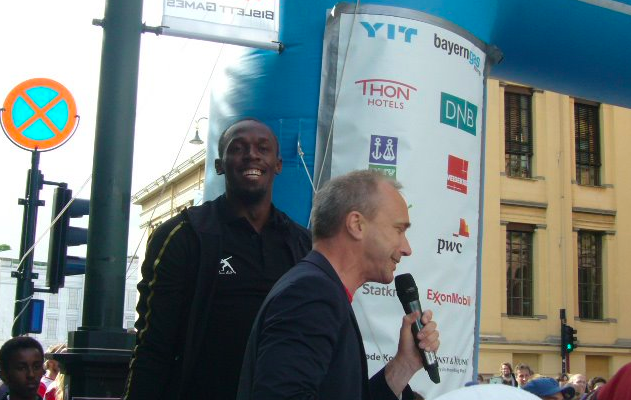 My first trip up to the Edinburgh Fringe festival was incredible – so much to see, so much to do. 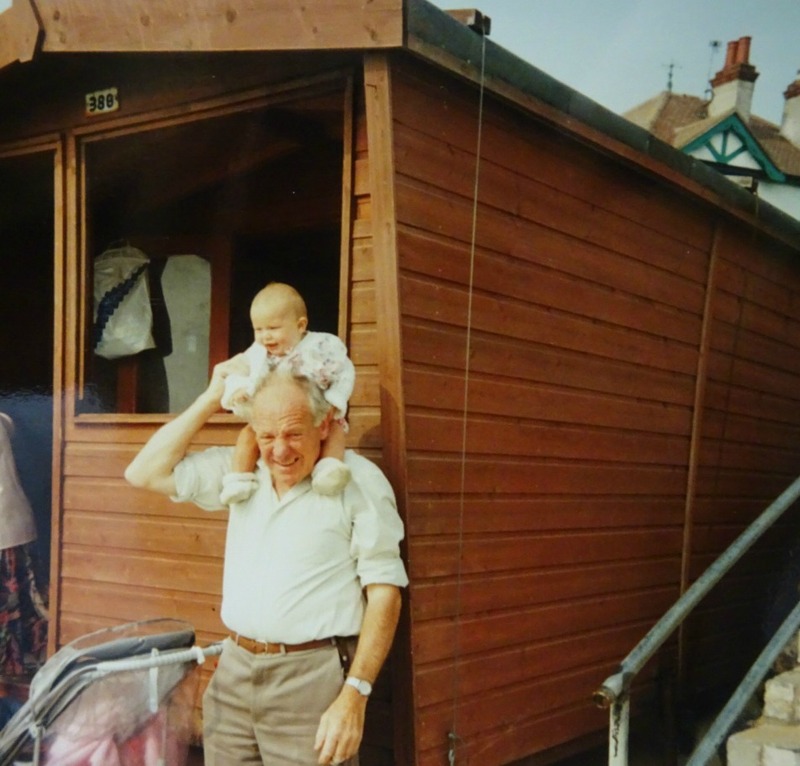 The next year we went again and we ended up getting the train home the day after we arrived because it felt awful to be away while my Grandad was at home ill.
11. Finding myself in Bruges watching a guy in a kilt playing the bagpipes. I was a little bit obsessed with Scotland at this point, so afterwards I went up to him and asked if he was from Scotland and he just gave me the weirdest look and walked off. 12. 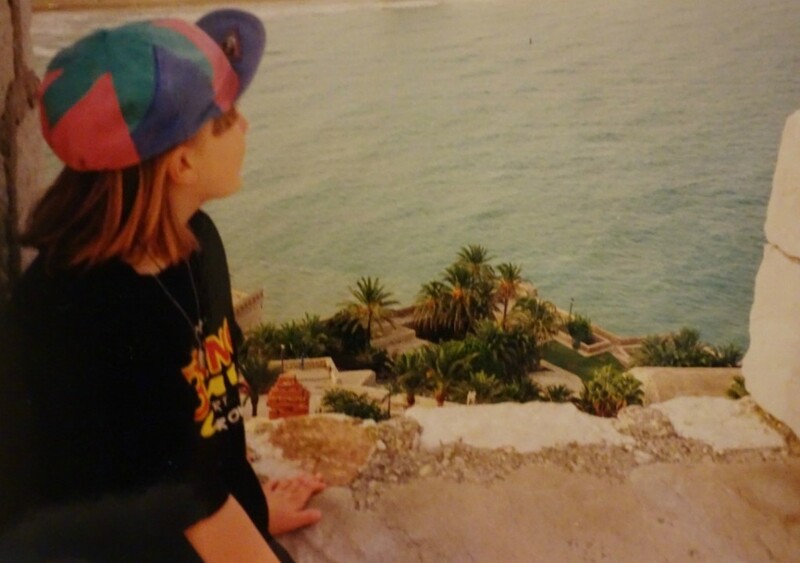 Being possibly the most 90s kid in Spain with my reversible cap and Beano t-shirt. 14. Genuinely being SO EXCITED to see the window of the Berlin hotel that Michael Jackson dangled his son out of. 15. Being told off on another caravan holiday by my nan for going head-first down the water chute instead of feet-first like the sign told me to. Whoops. 16. 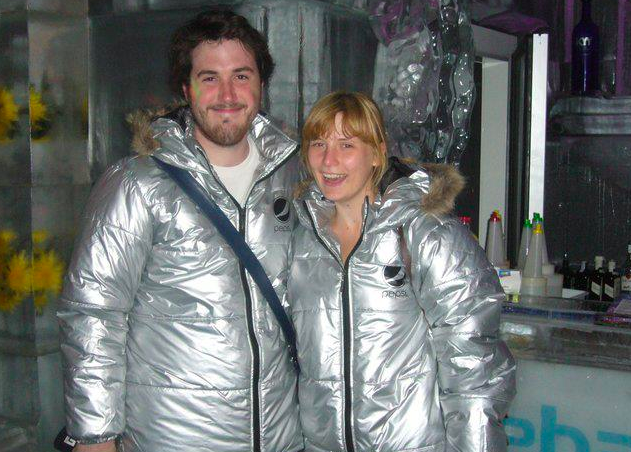 Going on my first holiday with my boyfriend to Barcelona back in 2010! One of the (surreal) highlights was definitely going to the Ice Bar and putting on huge, warm coats – all while it was 30 degrees outside. 17. Waking up on our first morning in Seefeld, Austria, and catching a glimpse of snowy mountains overlooking our steaming hot outside pool. 18. Leaping in the Colosseum. Enough said. 20. Driving into New York and catching sight of the Chrysler Building for the first time – and then weeping because a) I genuinely couldn’t believe I was in America, and b) I was really, REALLY tired. 21. Spending an evening in Naples in an old, rustic jazz bar drinking wine. 22. Getting an education in all things dolphin at Hong Kong’s Ocean Park – and then meeting Esther the dolphin up close in the pool. 23. Stepping into Iceland’s Blue Lagoon for the first time and remembering it was pretty much like receiving a warm, wet hug. 24. Walking across the Grand Canyon skywalk, half-captivated by the incredible views, and half-terrified that we were about to die. 25. Stumbling across the Copenhagen Street Food market and being unbelievably overwhelmed by how much food was inside. Everywhere. Here’s to making my 26th year one to remember! That made me snort lol quite badly. I’ll definitely drink to another year of adventures – cheers! Happy Birthday! 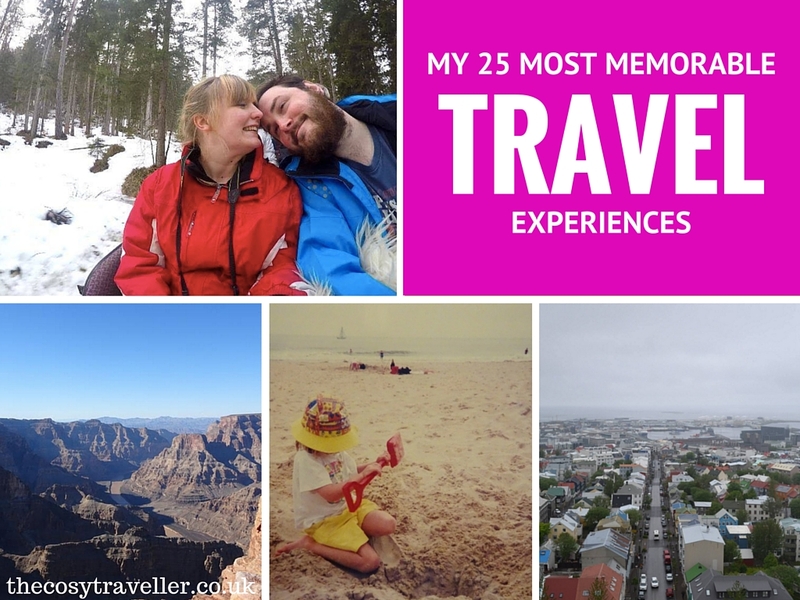 Your travel experiences look awesome, and for a 25-year old no less!